Purkal Stree Shakti launched one more store on the 13th of September, 2015 at Dehradun. This shop is in the premises of Hotel White House, a very old and well known hotel in this city. 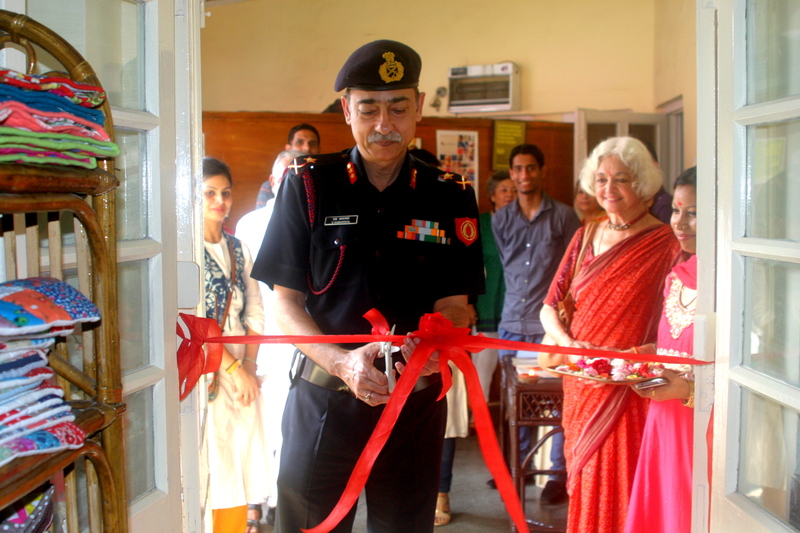 Maj. General S. Sabharwal, General Officer Commanding Dehradun sub-area inaugurated the shop. The glittering function was attended by many dignitaries of Dehradun. The shop is selling many beautiful products such as patchwork and applique quilts, baby quilts, cushion covers, quilted jackets and other useful products. Most of the customers are happy to support the initiative and good treatment of artisans. 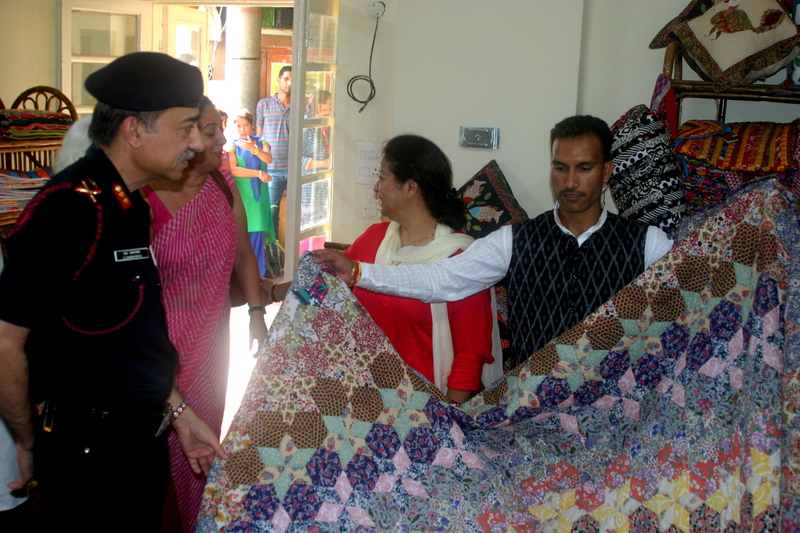 It will also be helpful in spreading Fair Trade message among the people of Dehradun. The location of the shop is in a well-established and popular restaurant, which will be helpful in attracting lot of buyers also. 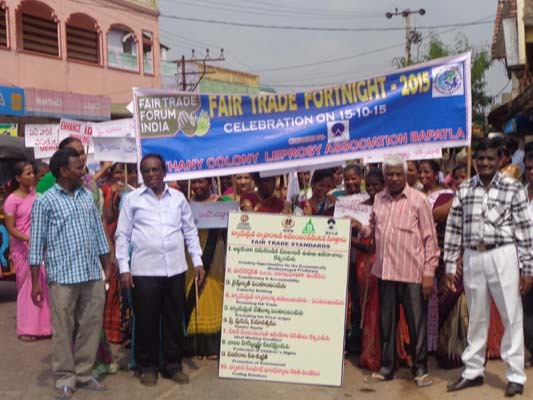 FTF-I along with its members celebrated Fair Trade Fortnight from 2nd to 17th October 2015. The theme for this year’s celebration was ‘BE AN AGENT FOR CHANGE’. There are different tangible or intangible agents who/which have played a major role in transforming communities through Fair Trade. The people who are part of the Fair Trade voice, that include-the producers and artisans, consumers, individuals who support Fair Trade, social entrepreneurs, Fair Trade organisations, the Fair Trade networks and the advocates and promoters of Fair Trade. FTF-I members partnered with external bodies like educational institutions and campuses, Government institutions and corporates to promote ‘Fair’ living and concept of Fair Trade and sustainable consumption in order to play our part to achieve the SDGs. 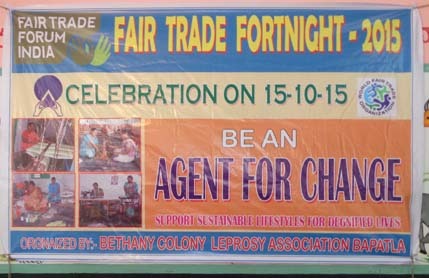 The FT Fortnight celebrations also coincided with WFTO’s ‘Break the Chain of Poverty’ form 11th to 17th October, 2015. The aim was that with Fair traders around the world, together with small producers and backed by consumers, we are breaking the chains of poverty. “It is unacceptable that there are still over 1 billion people living in extreme poverty and deep deprivation. That is why at WFTO we fight poverty together with the small producers through sustainable solutions. The 10 Fair Trade Principles are our weapon. It is important that the eradication of poverty is done together with those affected. And with the support of consumers and businesses Fair Trade can go even further in its contribution to poverty eradication.” – Rudi Dalvai, WFTO President. FTF-I ran an online campaign ‘Agents for Change’ in which it posted various Fair Trade agents for change from India to generate mass awareness and support for Fair Trade. FTF-I covered a bank as An Agent for Change or tribal women in Bijapur, Karnataka. The bank is helping women to become independent. A community radio station, Radio Kotagiri in the Nilgiri Hills is producing a series of program on various aspects of community development. The waste which is converted into high fashion products and brings changes in the life of many, with the efforts of Conserve India & Conserve HRP, showed how they have become An Agent for Change. Shanatimalai products, which are made of material which is not harmful for the environment, have become An Agent for Change. The wooden toys, which are colourful and eco-friendly, FTF-I presented a man with An Agent For Change, Mr Bhupati founder of Shilpa Trust, who is trying to revive the famous Channapatna toys with his efforts. An organization in Barmer district, is solving the water problem and is bridging the gap between water and people who are living on arid region in Rajasthan. FTF-I presented its various stakeholders like Refugees, Indigenous People, Differently abled, and farmers across India. 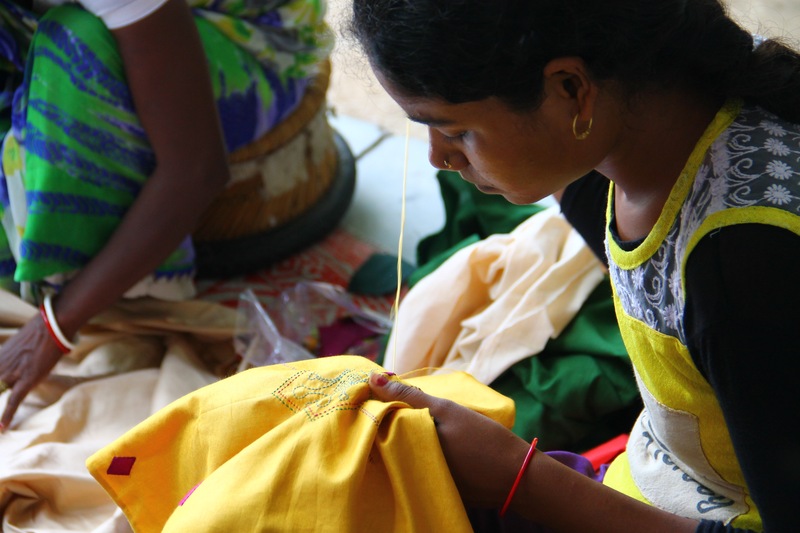 And FTF-I members based in the beautiful town of Auroville & Puducherry, promoting Fair Trade lifestyle & sustainable production, who are playing the role of An Agent For Change. With this campaign FTF-I tried to promote every aspect to generate awareness about Fair Trade. An awareness rally was organised by BCLA, Bapatla on 15th October 2015 at Bhavannarayanaswamy Temple. The Chief Guest Sri Hari Prasad, President of Rotary Club Bapatla Mandal inaugurated the rally by waving the Flag. 50 Female Artisans, 20 Staff and 20 Youth of Bethany Colony participated in the Rally. Female artisans walked in the rally and the staff along with youth distributed brochures along the way. The rally was covered by a local media group, MAA Cable (City Cable TV) and it was telecasted with the interviews with Mr. V. Showriappa (PC). Awareness about the Fair Trade Form-India was spread through slogans on the play cards. After rally, the awareness meeting was organised in which Sri. Hari Prasad President of Rotary Club was the Chief Guest, and Sri. Wesley vice President from Rotary Club, Dr. Devavaram Medical Officer from Salvation Army, and Dr. Ramamohanrao, Medical Officer of Gramasiri Urban Health Centre actively participated. The President of Rotary Club happily announced that they are going to allot their Kalayanamandapam for the sales/ Mela of the Rehab products for any number of times free of cost which indicates the immediate outcome of the Awareness Meeting. He also promised few sewing machines to the Artisans and some general Medicines to the Leprosy Patients. 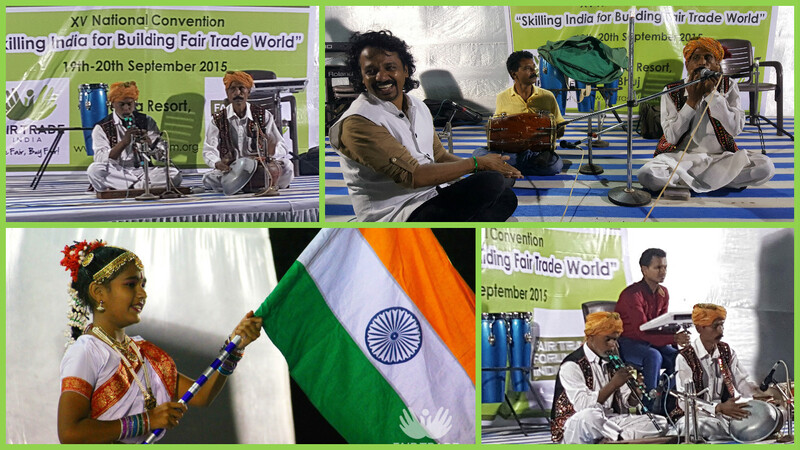 It was a great event which helped in spreading awareness about Fair Trade. 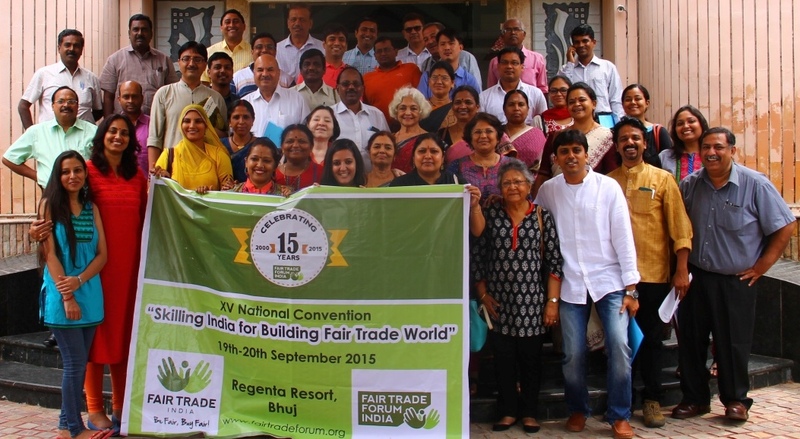 Fair Trade Forum-India organised its XV Annual National Convention on 19th to 20th September 2015 and Annual General Meeting on 21st September 2015 at Regenta Resort, Bhuj, Gujarat. 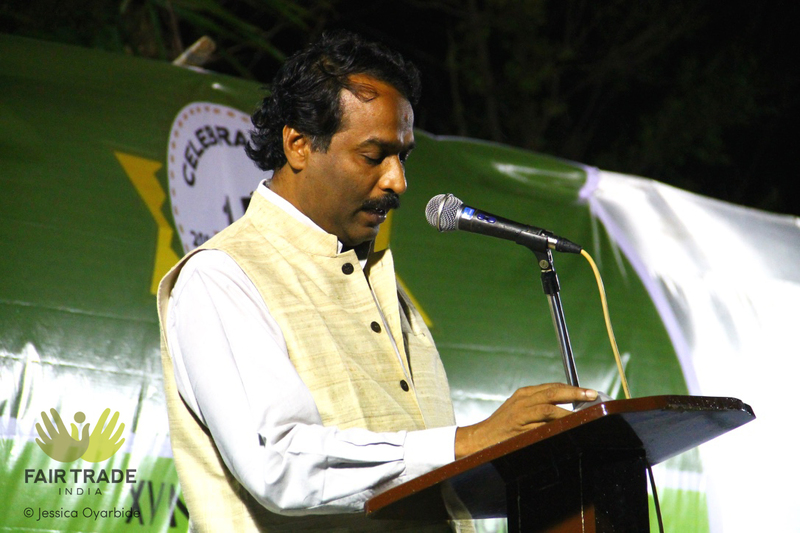 The theme of the convention was ‘Skilling India for Building Fair Trade World’. More than 60 participants attended the convention that included representatives from FTF-I member organisation, representatives from the civil society, local artisans, musicians and local print and electronic media. The aim of the convention was to discuss on Fair Trade approach to skill development in India and how various Fair Trade organisations can play an important role in partnering with Government to achieve the Skill India Mission of GOI. Today GOI is facing the challenge of paucity of highly trained workforce, as well as non-employability of large sections of the conventionally educated youth, who possess little or no job skills. Looking at the challenges, Fair Trade networks and Fair Trade Organisations (FTOs) can play an important role in making skill India mission successful and effective. FTOs can help GOI to provide skills with Fair Trade perspective. 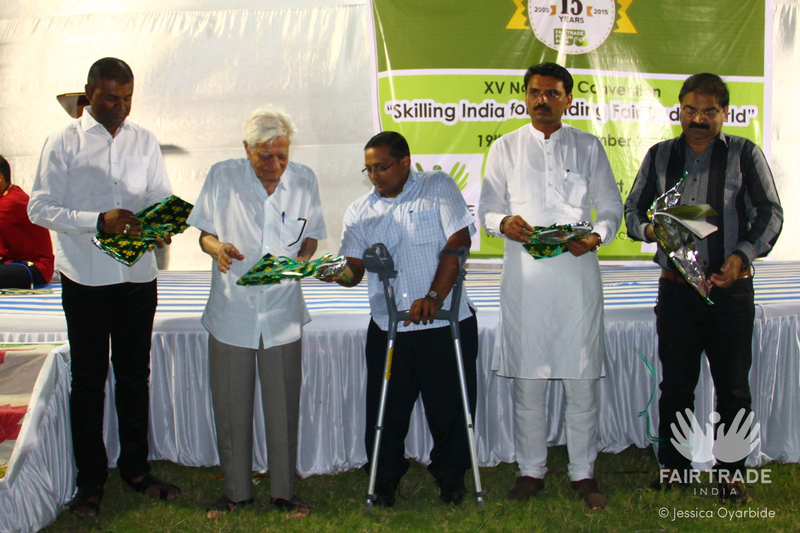 The convention was inaugurated by lighting the lamp in the evening on 19th September 2015 by Mr. Vinod Chavda, Member of Parliament, Kachch Constituency who was the Chief Guest, the legendary 92 year youngest Sh. Kanti Kaka (Sh. Kanti Sen Shroff), who was the Guest of Honour, along with Dr. K. Panchaksharam, Founder-President of FTF-I, Mr. Sudhir Gullaiya, Executive Director, TRIFED and Dr. Ismail Khatri, Shilp Guru, Gaffur Bhai, National Awardee Master Rogan Artist and Rani Ben, National Awardee, Master Embroider. Mr. Ranvir Sisodia from Dharohar, Master of Ceremony welcomed the gathering. Dr. K. Panchaksharam was invited to share about the special anniversary celebration of FTF-I on completing its 15 years journey. He explained about the genesis of the network and the people who have contributed to build this network and create impact in the lives of people through Fair Trade. School children and teachers from a local school in Bhuj were invited to present a cultural program in which a prayer dance and a group song were performed. The local artisans from Kutch also displayed their handicraft and textile work in a small exhibition organised at the venue. 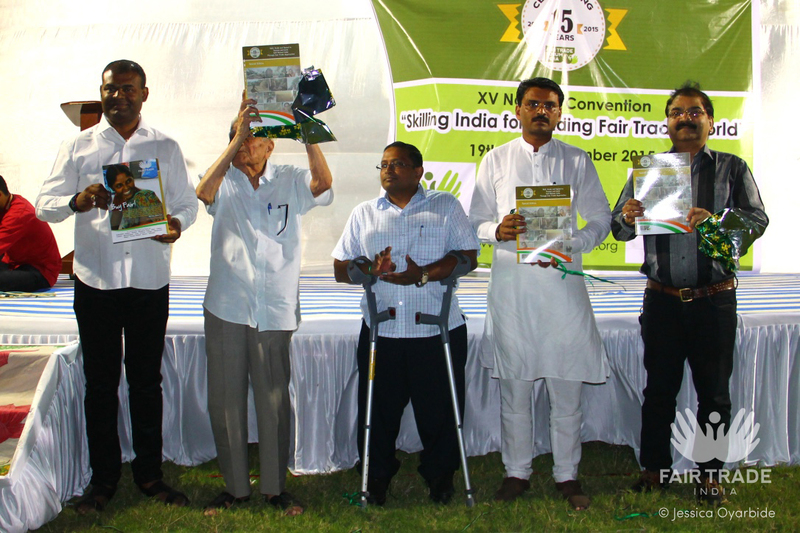 On this occasion, a special 15 years journey report of FTF-I was launched, the book highlights the impact generated through Fair Trade in India along with the efforts of FTF-I and Fair Trade organisations. The publication showcases the formation of the network, the early pangs of making a place in the social sector as a tool for poverty eradication and holistic development. It highlights the initiatives challenges and activities and brings out the best practices and achievements of Fair Trade organisations across India. The publication also pays tribute to the Fair Trade soldiers who devoted their lives to work for the development of the society on the principles of Fair Trade. Mr. John Samuel, an internationally respected civil society leader, public policy researcher, social entrepreneur and writer delivered the Prof. Shyam S. Sharmaji’s Memorial Lecture on ‘Fair-Trade as means for Sustainable Development in India’. He discussed on increasing social and economic inequality, issues of skill-gap, digital divide and also strategic ways to build and link local-national-and global economy through democratisation of economy, knowledge, technology and trade. He emphasised on the need of going back to the roots and implementing ‘Hind Swaraj’, the vision of Gandhi ji to empower India by empowering the villages. He said that the GOI, in order to achieve its Skill India Mission should focus on building skills of the youth in the villages itself. Fair Trade can play an important role by encouraging capacity building and skill building based on the local need of the communities. Use the best resources and talents from the village and provide skills in it. In conclusion he encouraged the Fair Trade fraternity to have a vision for India to “Make India in Villages, Make India Fair”. The inaugural program was concluded with local dance and musical performance and networking dinner. The Keynote presentation on the theme- ‘Exploring the possibilities of Skill Development in Craft & Textile Sector/ Opportunities for Fair Trade Organisation’ was jointly done by – Shri D.K. 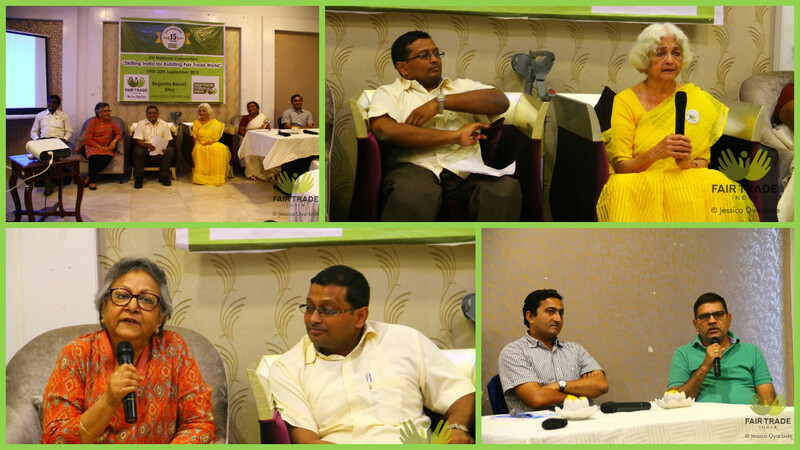 Sharma (IFS), MD, Gurjari, Mr. T. Muralidharan, Vrutti Livelihoods & Mentor, Mr. Sudhir Gullaiya, ED, TRIFED. Dr. Manjula Jagatramka from Vaitarna was also invited to speak on ‘Opportunities for CSR in Handlooms and Handicrafts’. The session was chaired by Mr. Mallikarjuna Iytha, President, FTF-I. Presentations on Digitalisation of FAIR TRADE INDIA brand and ‘Skill Building of Producers & Fair Trade Organisations Alignment’ were given by experts. The session was chaired by Mr. Pradeep Krishnappa, Vice President, FTF-I. He introduced the speakers for the session who presented on the new way forward for FAIR TRADE INDIA brand. Mr. Surendra Shahi, Head of User Support Team-Open Entry gave a presentation on creating FAIR TRADE INDIA marketplace for listing and promoting FTF-I member websites and products. It can be either a B2B or B2C e-commerce platform. He suggested possible partnership of FTF-I with Open Entry to provide this service to all interested FTF-I members. Ms. Jessica Oyarbide, Communication Strategist from Argentina presented on Branding Fair Trade ‘Skill Building of Producers & Fair Trade Organisations Alignment’. She shared her personal experience when creating brands with producers and entrepreneurs at the Base of the Pyramid, with the aim of improving their business and the recognition of their roles as entrepreneurs. She also pointed out the necessity of Fair Trade Organisations to be aligned under Fair Trade India brand with the objective of keep building the network and increasing consumer awareness. Ms. Bagisha Suman, PhD Scholar from Jawaharlal Nehru University, Delhi one of the first person to do a PhD in Fair Trade, presented about the role of Fair Trade in uniting the people and reviving and redirecting their skills. She shared through her own field visits with different FTOs in Kerala, Telangana and Bihar. The one common non-monetary benefit of Fair Trade which is clearly noticeable is the feeling of solidarity and the sense of trust generated with producing communities, living in the remotest parts of India, where most of the people are not educated or well connected with development and infrastructure. Group discussions were also held on different topics followed by a session of “Mann ki Baat, Fairness ke Saath”, where member organisations were invited to share about their Fair Trade journey experience and their engagement with FTF-I in last 15 years. The invitees were Ms. Irani Sen, CRC Exports, Ms. Chinni Swamy, Purkal Stree Shakti Samiti, Mr. Devendra Dhariwal, SETU-the bridge to artisans, Mr. V. Showriappa, Bethany Colony Leprosy Association and Mr. Samuel Masih, Noah’s Ark International Exports. The session was chaired by Mr. Mallikarjuna Iytha, President. Mr. Devendra Dhariwal shared how SETU handles the monitoring of the growth of their organisation and the artisans as per the ten principles of Fair Trade. SETU has devised a set of guidelines which focus on- Fair Wages, Safe Workplace, Good Health Facilities, Ideal Working Hours, No Child labour, Education, No Gender Bias, Preserving the culture & traditional skills of the artisans, Environmental friendly process, Self sustainability, Social upliftment, Capacity increase in last 3 yrs, Product sustainability and Nature of Organisation. For each guiding point they have mentioned the indicators. He gave an example by explaining a matrix which presented the growth of SETU calculated under each of the guiding points. For each set of guidelines, there is a rating system upto four. A group must secure min 50 points (including bonus points). This system has been effective in measuring the overall growth of the organisation and coming out with practical solutions wherever necessary. SETU has been implementing this system since 2012. The last session of the day was the business session related to the matters of the AGM to be taken up by the Executive Council. 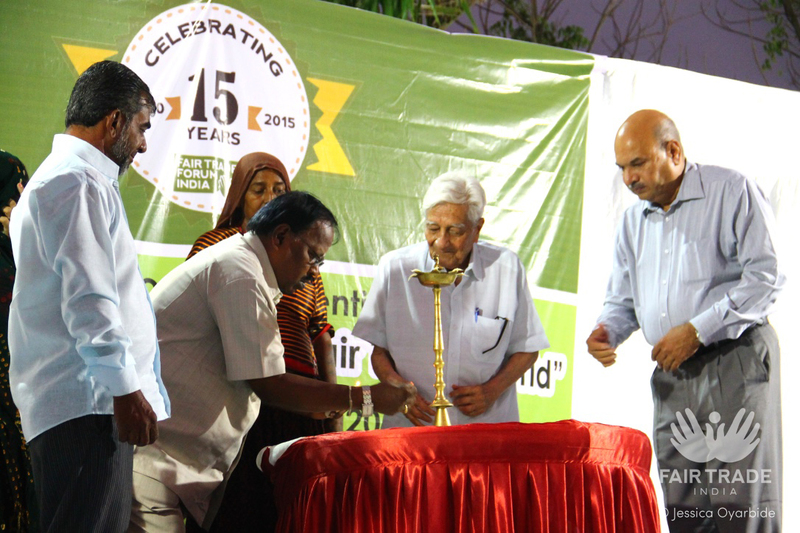 The event was concluded in the evening by Mr. Mallikarjuna. He proposed the vote of thanks to all the resource persons for their time and knowledge sharing, and the members for their active participation in the national convention. 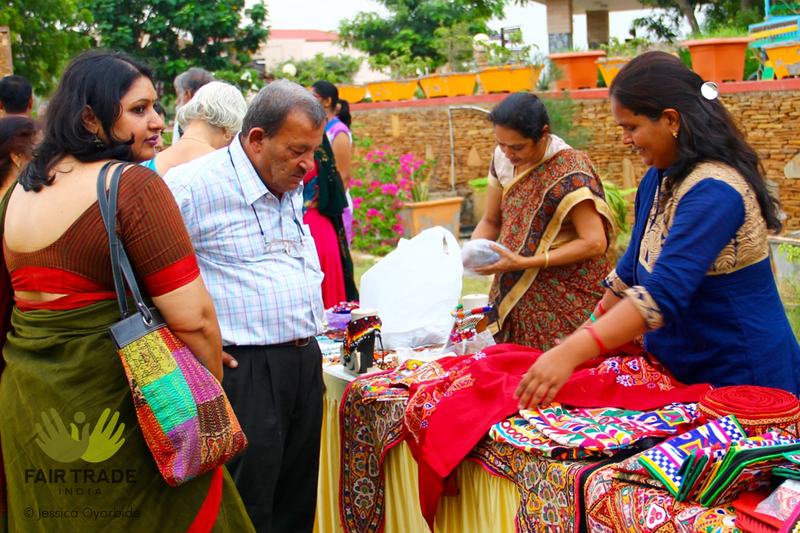 Overall it was a successful event and everyone enjoyed a good sharing time with their fellow Fair Traders. Of course, to top it all was the unique experience of Kutch and its own beauty. Mr. Rudi Dalvai, President, WFTO visited Delhi in the month of October 2015. 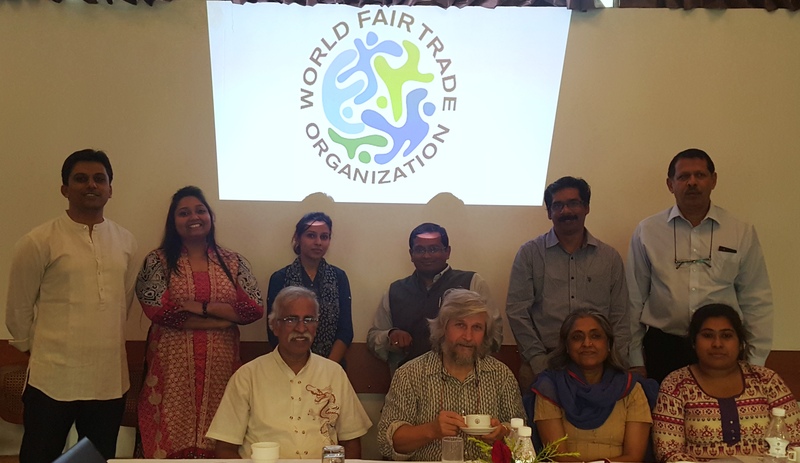 He met Fair Trade Forum-India team to discuss about the 2017 WFTO Biennial conference for which India has been selected to host the event. Ms. Roopa Mehta and Mr. Johny Joseph, board members of WFTO also participated in the meeting. FTF-I presented the WFTO board with their ideas and planning to co-own the conference to make it successful and effective. This is a good opportunity for Indian Fair Trade fraternity to come together and work as a uniform voice to advocate for Fair Trade. Mr Mallikarjuna, President FTF-I, Mr Pradeep Krishnappa, Vice Secretary along with staff of FTF-I participated in the meeting. 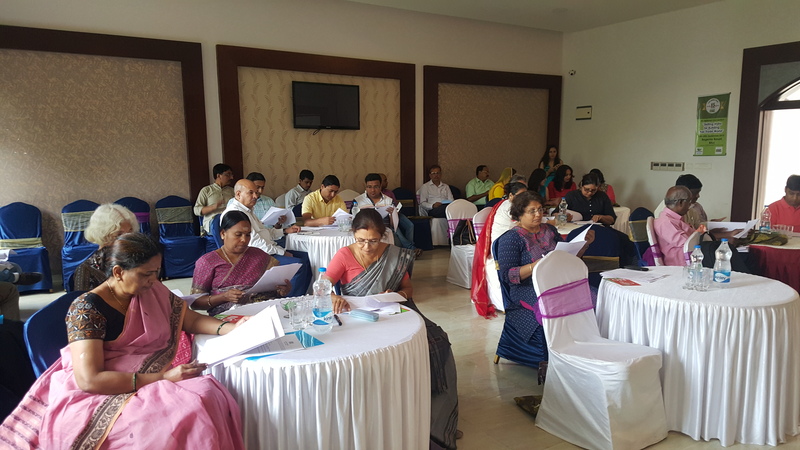 Fair Trade Forum – India participated in the Round table on Strategic Role of NGOs in CSR Intervention organized by PHD Chamber on 30th July, 2015. Dr Kiran Bedi, Founder, Navjyoti India Foundation, inaugurated the session on Strategic Role of NGOs in CSR Intervention, where more than 50 NGOs participated. Dr Bedi addressed the round table saying, “Some companies have the understanding and sensitized about Corporate Social Responsibility but most of them are still trying to get in terms with the legislation on CSR in the Companies act 2013. She congratulated PHD Chamber for their initiative in organizing this Round Table and further directed PHD Chamber to come up with a directory of NGOs working in specific domains, a web portal and next programme in continuity with this Round Table, where Corporate can deliberate upon the problems they are facing in channelizing their CSR funds for sustainable collaboration with NGOs. In the session Mr Saurabh Sanyal, Secretary General, PHD Chamber, Dr Suresh Goyal, Chairman, CSR Committee, PHD Chamber; Dr. Kiran Bedi, founder Navjyoti India Foundation; Mr. Rohit Gupta, Director, Pustak Mahal; Dr. Jatinder Singh, Sr. Secretary PHD Chamber, Dr. Suresh Goyal, Chairman, CSR Committee, PHD Chamber stated, Competition can never be a win-win situation; its inherent quality is win lose. He urged Corporate and NGOs to synergize and work in perfect harmony with each other and NGOs must act like the conscious of the Corporate and cautioned the Corporate to use the power responsibly. FTF-I plans to attend such sessions where new contacts can build up and we can work for the betterment of the artisans. FTF-I recognizes the need to be connected with CSR activities and how we can get befits from the private companies. India is a country of myriad contradictions. On the one hand, it has grown to be one of the largest economies in the world on purchasing power parity, but it ranks only 60th out of 148 countries in the World Economic Forum Global Competitive Index. It is still home to the largest number of people living in absolute poverty, deprived of adequate access in the basic needs of life such as health, education, housing, food, security, employment, justice and equity. Issues of sustainable livelihood, social and political participation of the vulnerable group exists as the major problem in the developing nations. Fair Trade Forum – India offers internship opportunities to the students of various backgrounds to make them understand the working of Fair Trade members in India and send them on the field visits to know more about the artisans and producers working at the grassroots level. Mr OP Yadav and Mr Khitish Pandya attended the NGO meeting organized by Indian Institute of Foreign Trade for the arranging internship for the students. The meeting started with the welcome address by CP (GSD). CP (GSD) acknowledged the efforts made by NGOs towards sensitizing IIFT students in the social issues. Director of IIFT welcomed the representatives of NGOs by welcoming them in the meeting. He mentioned that IIFT is completing 10 years of its association with NGOs for developing Social Awareness amongst its students. IIFT is one of the very few B-Schools which awards credits to students and evaluate their performance for the NGO attachment. With objective of the initiative to sensitize the students to focus on the welfare of the under privileged in the society IIFT organized this meeting where OP Yadav and Mr Khitish Pandya represented FTF-I. Institute solicited the cooperation of the NGOs for the Skill Development of students on various aspects of social engineering with this purpose FTF-I will consider offering internship to student of IIFT. Director, IIFT, opined that the initiative will encourage the Global Managers of tomorrow to be socially responsible in their future corporate assignments. It was emphasized by Director that IIFT is committed towards the social transformation of the students and thus devotes considerable academic time for NGO activities. It was mentioned that courses on ethics and values are included in the academic curriculum of IIFT to sensitize our students regarding social values. During the internship period, students will be exposed to the best practices adopted by all Fair Trade Member organizations, our best practices, cherished values, challenges and core activities. This interaction session with various Fair Trade organisations will sensitize the students on the selfless efforts towards the welfare of the underprivileged in the society. Students will be educated and informed about the projects and a mechanism which will benefit them to understand a new angle for the society. IIFT also informed that 69 NGO projects submitted by the MBA (IB) 2014-16 batch have been displayed in the library; we are hoping that Fair Trade information will also be presented with a summary about Fair Trade Forum – India brief note on the website as well. IIFT initiated the Social Awareness Programme in 2005, in which about 2000 students have since been benefitted under the programme. This will be a three weeks programme based on the students’ preferences. Director also apprised about the Social Initiatives which are taken by IIFT students. It was mentioned that students developed a mobile application for women’s safety named as WISH – Women in Safe Hands. The launch was followed by a Marathon with the theme – Run for Women’s Safety. 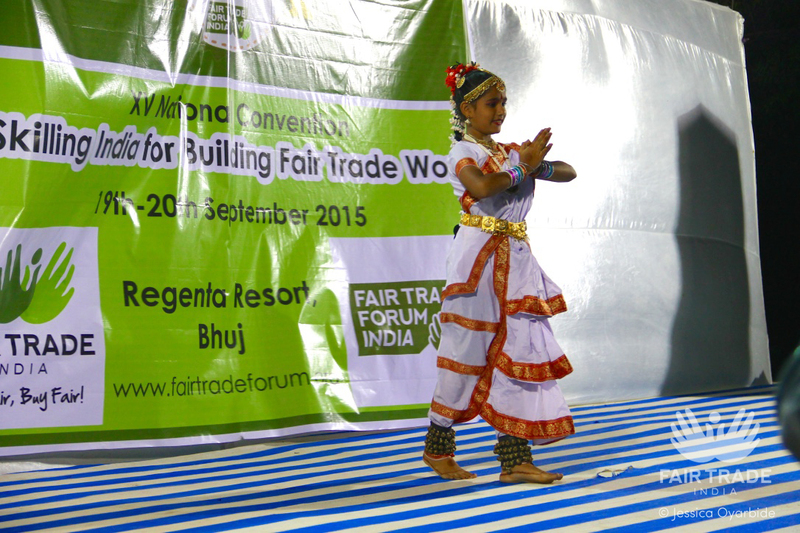 This session was also attended by Fair Trade Forum – India by Ms Amy and Ms Sadhna. With the aim of interviewing different Social Entrepreneurs, Jessica, our intern from Argentina, visited SETU- The Bridge to Artisans and JKSMS in Jaipur and Sadhna in Udaipur, Rajasthan. During her visit to SETU, she got to know about the different plans being implemented in the rural communities and how the impact is measured very carefully through a system created by the organization. While visiting JKSMS she got to know how the organization handles to create impact in different fields, focusing on children, and she shared a dinner with the orphan girls from the house that JKSMS has. In Udaipur, Jessica met the producing centre of Sadhna, where several people handle the whole production chain, from the rough materials until the package is ready to go and to export, in some cases. Three organizations working towards different goals but with the same objective in common: to generate social impact and improve life quality.